Twenty-eight employees from Georgia Power’s Metro South Region arrived at Christian City early Monday morning to serve the children and senior adults who live on the 500-acre Christian City campus in Union City, just south of the Atlanta airport. According to volunteer team leader and Atlanta native David Herring, the program is facilitated through the Citizens of Georgia Power group, which encourages employees to sign up to volunteer in the community throughout the year. “We have ten different projects going on throughout the Metro South Region today,” Herring said. Christian City President and CEO Len Romano welcomed the volunteers and expressed his gratitude for their choice to celebrate the legacy of Dr. King by serving at Christian City. 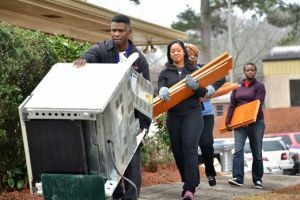 According to Connie Hall, Christian City’s volunteer coordinator, this is the twelfth year that a group from Georgia Power has volunteered on the Christian City campus. “You are our life savers,” she said in welcoming the employees. The volunteers divided into three groups to assist with playground landscaping at the Children’s Village, finishing a shed in the community garden, and taking inventory at a storage facility on the Christian City campus. Several employees brought their children along for hands-on learning about the importance of serving in the community.